18a. [Fireworks expert], PYROTECHNIST. Had no idea that was a word. Pyrotechnics, sure. 29a. [Head and neck physician], OTOLARYNGOLOGIST. Aka an ear, nose, and throat doc (or, since there’s no -rhino-, an ear and throat doc). 51a. [Hard rubber, maybe], MASSAGE THERAPIST. That works, though the ending of 18a may well have slowed down solvers besides me. A little surprising to see ITERS and TARE in a Tuesday grid. 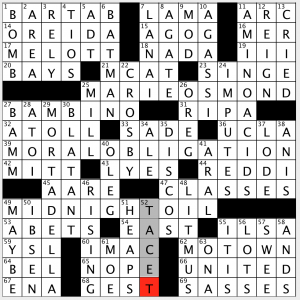 Those feel like old-school crosswordese to me (though the rarer TRET is definitely worse than TARE—and both of those words reside in the same synapses in my head). 12d. [“Angels & Demons” group whose name is Latin for “enlightened”], ILLUMINATI. My favorite place for deep-dish pizza is Lou Malnati’s, which sounds like a front for the Illuminati. 31d. [Affords opportunities], OPENS DOORS. Nice phrase. 40d. [Stuff caught in a filter], SPAM. Yes! If you dump a bunch of cans of Spam into the swimming pool, the filter will probably get clogged. I am beat, people. Over and out, 3.75 stars. I am going to date myself – I remember when the Super Bowl halftime show was Up With People performing! According to Wikipedia, they performed four times between 1976 and 1986 at Super Bowl halftimes. I am more than a little surprised that they still actually exist! 64A [“Strange Condition” sinder Pete] YORN – Who? Oh, him! I’ve heard of Fetty WAP and NWA, though! 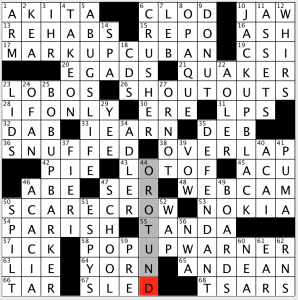 44D [Full-voiced] OROTUND – Let’s learn a new word, shall we? Crossing YORN made this a little tougher, but not too tough. As usual, another entertaining Jonesin’ puzzle. 3.8 stars. My favorite part, though, I think was the reminiscing about Up With People! 62A [Record label founded in Detroit … and, when divided into three words, where to find the answers to starred clues?] MOTOWN, or M-O TOWN. So the theme answers all are two-word phrases with the initials M.O. Nothing overly fancy, but the wordplay of the word MOTOWN is actually kind of clever and leads to a nice payoff near the end of the puzzle. I didn’t notice the MO initials while solving; maybe I was solving too fast! 1A [Where to find screwdrivers?] BAR TAB – … or in my kitchen…. 19A [Square root of IX] III – Nice way to clue III. At least it seems new to me. 60A [Apple computer] IMAC – I am a new Mac disciple. Typing this on a Mac now. They’re too expensive, but that’s the only downside! 68A [Daring exploit] GEST – One of a couple of obscure entries in the puzzle. All but one crossing pretty easy, though. 29D [Italian pork sausage] MORTADELLA – Great entry. I love sausage, too. 52D [“Be silent,” in music] TACET – The other obscure entry. Doesn’t hurt the solving experience, though, because it’s gettable. I’m not complaining! So again, a nice Tuesday entry. Let’s say 3.7 starts for this one. Until next Tuesday! “How do I love thee? Let me count the ways…” Superb theme (see title), superb theme fill (see title), great theme density (70 squares! ), intriguing and scrabblicious theme clues, strong remaining fill, evocative and sometimes laugh-out-loud funny cluing elsewhere, too. Okay. See ya! 16A./13D. BUDAPEST, HUNGARY / DANUBE [Sziget Festival city seen from the 13-Down]/[See 16-Across]. Sziget Festival?? (See mention of scrabblicious clues…) Hungary rocks! This may not be “the Waltz King”‘s “Beautiful Blue DANUBE,” but from the looks of things, this rocks, too! 27A./18D. CAIRO, EGYPT / NILE [“City of a Thousand Minarets” seen from the 18-Down]/[See 27-Across]. This was the one clue/fill pair I was actually familiar with and didn’t need to rely on crosses to complete… It’s not the bestest movie ever, but Cairo Time (2009) will give you an eye-opening glimpse into this pre-Arab Spring city and its culture. So those are our themers, two of which take us to Europe (where those EUROS may be spent), one to Africa, one to Asia (home to the Yellow River valley’s SHANG dynasty). No passports required. Simply an open mind. Works fer me! And as I’ve said, the remainder of the puzzle works fer me, too. Hard not to like a puzzle filled with the likes of FRAIDY CATS, “BE NICE!,” CARAMELS, GREASE (clued in connection with prepping to bake homemade cookies), and EGGNOGS. Or cluing that ties disparate fill together, like [Hat sticker] and [Sticking point at dinner?] and [Sticky-and-sweet candies] for PIN and TINE and those CARAMELS. VICINITY (especially good in a puzzle with geographic references), UNDETERRED, SINEWED, SIGN IN, IN RANGE, contextualizing ITSELF by reminding us of FDR’s words that we have [“…nothing to fear but fear ___”]—all of these I add to the list of assets today. Finally, hurrah for the big “hah!”-inducing, non-Army-/-latrine-related [Bathroom fixture for privates?] BIDET combo. Is Liz a lady or what? A very funny one at that. And on that high note, I leave you. Have a good week, all—and see ya next time! Good afternoon, everyone! I hope everyone is having a great day today! 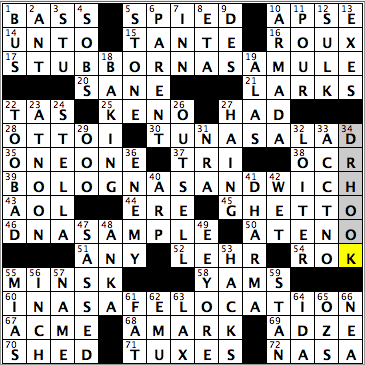 Today’s crossword puzzle, brought to us by Mr. Martin Ashwood-Smith, has us looking into the stars and skies above, as each of the five theme entries are multiple-word answers in which the letters NASA span across two of the words (72A: [Space org. that’s literally lost in 17-, 30-, 39-, 46-, and 60-Across]). First off, I always get a chuckle out of the 15-letter entries that have only one word as a clue. I always expect a long, verbose clue attached to it, and, sometimes, that does happen. But to just see “ornery” and “secure” and see the 15 white boxes that accompany it, I marvel at it. I’m sure I’m the only one who does now that I say this. Anyways, after my amazing trip to Montréal, I downloaded an app so I can learn French, but I haven’t gotten to the names of family members, which definitely would include TANTE (15A: [Oncle’s spouse]). There’s a couple of references to time, with AT NOON (23D: [When both hands are up?]) and A TEN O, which I’m sure enough people on here would cringe at that type of fill (50A: [“…_____ ‘clock scholar”]). Well, in most sports, a ONE-ONE score would come early in a game, unless you’re a fan of soccer, where a good number of entire games have ended 1-1 (35A: [Early tie, perhaps]). Could have said the same for hockey as well, but then the NHL had the knee-jerk reaction to eliminate ties after the lockout that wiped out the 2005 season. I’m fine with whole regular-season games finishing in ties, thank you very much! OK, going on a sports rant here, so I’ll just head to the “sports…smarter” moment, which I’m sure will make you laugh – especially since there’s video accompaniment. This entry was posted in Daily Puzzles and tagged Elizabeth C. Gorski, Frank Virzi, Martin Ashwood-Smith, Matt Jones, Tom Pepper, Victor Barocas. Bookmark the permalink. Amy my synapse has TARE but not TRET. Never heard of Tret, just looked it up and I can see why it’s in the same dendritic spine… But we actually use the word TARE in lab. If you’re measuring a drug, you put the little plastic container on the scale, tare it (zero it out) and then weigh. I also use it in my kitchen, out of habit. So to me it’s not crosswordese, it’s my usual geek talk (I often say “bench” for countertop and I label and date my frozen food like lab specimens…) . TARE is used by pretty much anyone who sells anything by weight as well. We used to have TARE buttons on the cash registers at the grocery store I managed when I was younger. We sold expensive spices, so a gram could make a big difference. Most solvers, of course, do not work in science or supermarkets. But they do go to supermarkets and to vets. 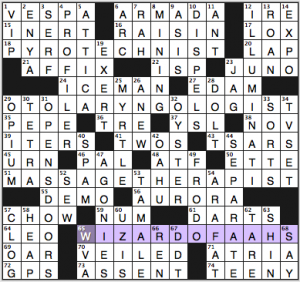 And most people have done high school chemistry; or at least most people who solve crosswords I assume. I’ve been to various supermarkets hundreds, if not thousands, of times. I’ve been to multiple vets several times. I did high school chemistry. I’ve still not heard of this. And I’m not surprised. TARE is not well-known, clearly. I didn’t mean to say that TARE is a word everyone should know, only that it is definitely still in use. Whereas I’ve never heard anyone use TRET. Tare also appears on thousands of semi trucks across the nation. Or, say, anyone who uses a kitchen scale, especially a digital one. Today’s WSJ is by Heidi Moretta, which appears to be a new Mike Shenk pseudonym, anagramming to “I am the editor”. Nice anagrammatic detective work, Al! 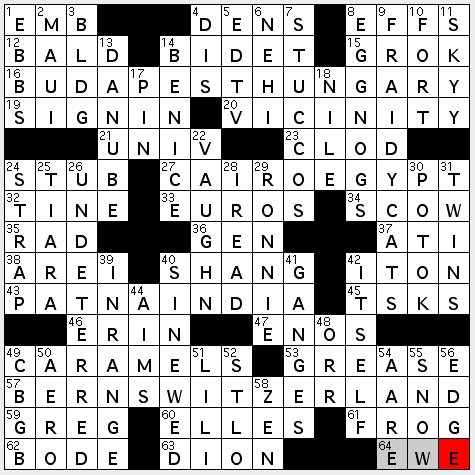 New WSJ daily crosswords seem to be very good so far. Yesterday’s theme, in particular, was rather interesting. Just another one for the LAT theme. 61D “Stooge with bangs,”…Moe. One of my favorite Crossword Nation puzzles ever. Loved the city/country with the river intersecting it. Still good quality fill with all that theme material. and i couldn’t agree w/you more!